Today, I wrote to a “secret” group of homeschool (and former homeschool) moms, asking for perspective. I had a feeling they’d tell me that I’m doing just fine. So far, in fact, they have. But in this, and in other homeschool-related endeavors, I just can’t seem to find the right balance, where I’m pleased with what we’re doing. My oldest three children are boys, and my youngest three are girls. I think I was/am pretty rigorous with my older boys. That approach has worked well on my oldest (now a university freshman on nearly a full-tuition scholarship), and for my 11th grader who is still homeschooling, but nearly independently. My rigorous requirements didn’t work fab on my 9th grader, who is thriving in his first year in a small, public charter school where they seem to value his… free spirit a little more than I do. So, I’m really only schooling my 4th and 2nd grade girls. 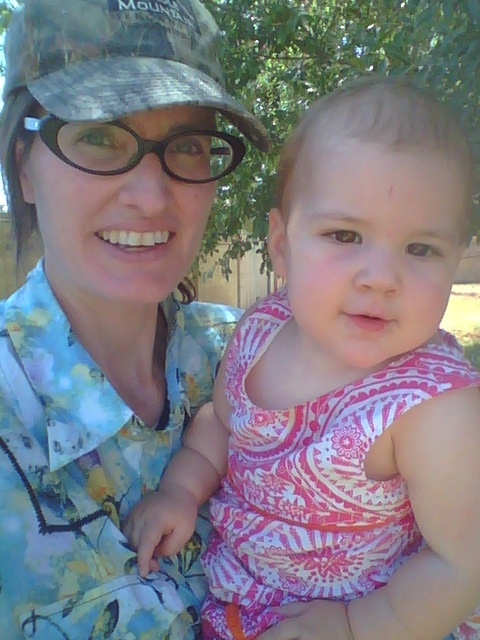 I also have a 2-year-old who makes things challenging and helps us to laugh and gives lots of hugs and kisses. Last summer, I told myself that I was going to make school FUN for my girls, after several years of really just focusing on my boys. I started a homeschool support/play group that has unintentionally ballooned — I now lead this group that has 179 families in it. It is a very relaxed group, a social network, really. Me “leading” is really a misnomer. I organize most events and communicate with everyone in person and online. With that group, we have weekly three-hour park days. We have one or even two field trips or activities with the group nearly every week. (This week, we’re going to the library for a decorate-your-own-journal art hour, and going to a local organic farm on Friday.) The girls are in weekly piano lessons and loving it. They play together more beautifully than I ever hoped. We spend lots of time outdoors every day. I have a veggie garden and they all putter with me. Our science yesterday was inspecting cilantro blooms and seeds in various stages of development, talking about how plants bolt, bloom, become pollinated, and develop seed that we can save. They also do seat work nearly every day (journal — writing and drawing; math; handwriting; and phonics/grammar). We have done lots of reading for fun — we’re working our way through the Little House series and are currently just beginning The Long Winter. The girls read on their own, fiction and nonfiction, a ton. My almost-10-year-old is the Arts and Crafts Queen and is working on some project all the time… She also is taking every-other-week drawing lessons from two ladies from church. In other words, this school year is virtually everything I had hoped. HOWEVER… I’m not really an unschooler at heart. I feel much better with structure. I feel such guilt that we are on week 5 (FIVE!) of (old) Sonlight Core 2. Week five. We’ve barely gotten through anything, really. When I read out everything I’ve written above, it seems like I should be pleased. But, honestly, I feel a little out of sorts, like I’m doing them a disservice for not being more regimented and rigorous. We are ENJOYING the school year. Yet, I have thoughts like, “I required so much more of my sons. Am I being unconsciously sexist by doing so little real schoolwork with them? ?” Seriously. I don’t know what I need to be satisfied. This school year is one of the best, experientially, we’ve ever had — and this is my 14th year!! But, I just feel so uncomfortable not checking those boxes in the Sonlight Instructor’s Guide. I feel guilty. At the other moms’ suggestions, I’m going to add more science and have them read aloud to each other and me. But, mostly, I think I just need to adjust my own attitude and enjoy what is left of the year. I need to start keeping track of how many pounds and bunches of produce I harvest, because it kind of FEELS like my summer garden wasn’t very successful. But, when I confessed that to my husband, he looked at me like I was out of touch with reality, which IS definitely a possibility… But, so many of the things I planted didn’t work out well. My only problem right now is that I likely didn’t give the Greyzini enough room to grow, so the plants are already crowding the carrot area. But, my carrots — Atomic Red from Pinetree — are having a hard time germinating and taking off, so I figure if they’re dominated by the Greyzini, so be it. White Sweet Spanish onion — These are slow to take off, as well… but onions always are. Bloomsdale Longstanding spinach — This is the first time I’ve planted spinach. It is having a hard time germinating, and the small sprouts that have popped up seem to be a favorite of bugs. A Giant Mix zinnia — these have germinated and are growing well. I’m thinking that a “giant” zinnia was probably not the best choice; as the garden veggies start struggling to soak in as many of the pale sun’s rays, I don’t want flowers shading them. If worse comes to worst, I could yank them, I suppose. Super Sugar snap pea — These look lovely and are a good 6-8″ tall. I’m pretty sure I had 100% germination, and they start germinating in 7-8 days, and grow quickly. It’s very satisfying to see a plant grow healthy and strong after only a week or so. I have an 8′ row in my 8′ x 12′ bed and have sown another 12′ in my new garden bed, the first of which just started sprouting a few days ago. My Clemson Spineless okra is still producing!! Those bushes are 5-6′ tall!! It’s pretty amazing. Now that it’s a tad cooler, they don’t grow nearly as quickly. But, they’re still alive! I’ve heard from local gardening groups and a bit of research that one can overwinter okra plants, but they are very cold-sensitive. I’m not positive, but I think I’m going to try. The aforementioned 12′ of Super Sugar snap peas. Lettuces — So far, both a Pinetree Lettuce Mix as well as a mix of Simpson Black-Seeded and Romaine lettuces, the seeds of which I saved from previous lettuce plantings that I let flower and go to seed. In my experience, Simpson Black-Seeded is the most successful lettuce to grow in Maricopa County. But, I’m looking forward to a greater variety of lettuces. Alaska Mix nasturtium — which I chose for its variegated leaves. Red Cloud beet. I ❤ beets. Harris Model parsnips — I probably wouldn’t have attempted parsnips, as I know they taste better after a frost, which we’re not likely to have. However, the CSA I hosted for nearly three years, with organic produce from Crooked Sky Farms, grew parsnips very successfully. So, I’m trying it. I also transplanted a bunch of I’Itois (EE-ee-toy) onions — 18 bunches, to be exact — from my containers. These green/spring onion-type heirloom, bunching onions are AMAZING. They’re holdovers from the CSA. Plant one bulb, and a year later, you have 50. They just don’t die. They go dormant in September, but start sprouting back in October. Literally, it’s year ’round “free” green onions. I haven’t purchased green onions in at least two years, maybe longer. I figure I can go without, the one month they die down. In the space remaining in the big garden bed, I plan on sowing more lettuce, bok choy, collards, some more flowers (probably gaillardia), and more onions — if I have the space. One more note about gardening in the winter. OK, two. Maybe three. Winter gardening is kind of a crapshoot. Last year, we had ZERO freeze days. The year before, we had five — with three of those being back-to-back, which is kind of unprecedented cold for the Phoenix area. The only bad news about having such a large garden is that I probably don’t have enough sheets, et al, to cover everything, if it does freeze. So, I’ll probably be praying for no freezes. The “days to maturity” on each packet of seed don’t count for much. Yes, things will grow beautifully here in the winter (unless it freezes), but as the sun’s rays are not nearly so strong or long as in the summertime, things take longer to grow. Still, it’s so worthwhile growing in the winter, as a greater variety of veggies do well here in the cool months: all cole/cruciferous crops, all root crops, anything leafy, plus other extreme-heat-sensitive veggies like peas. My permaculture ideas — going through the tremendous strain of digging out SUNKEN beds when raised beds are all the trend right now, has proven to be a good idea. Other than keeping the seeds moist for germination by light sprinkling, I’ve watered my garden NONE in the last almost-two months. The garden beds are placed at the lowest slope in our yard, so the rainwater soaks and percolates down to that area. In 110°+ heat, there’s NOTHING that can be done to gardens to preserve water; you just have to water, and usually daily. But, now that it has cooled down and we’ve had a few fall rains, the sunken bed idea is paying off. A crazy-busy season has passed, and a regular-busy season is here! I truly still love writing. I’ve just been insanely busy. My load right now is somewhat lighter, which allows me the luxury of reflecting, here in my neglected blog. (Note: I have no idea why the sizes of fonts change throughout this post. Rather than taking the time to figure it out, I’m leaving it. Sorry-not-sorry.) Edited to add a few more things about Fiala, and to note that you may click on each picture to enlarge it, if you care to. 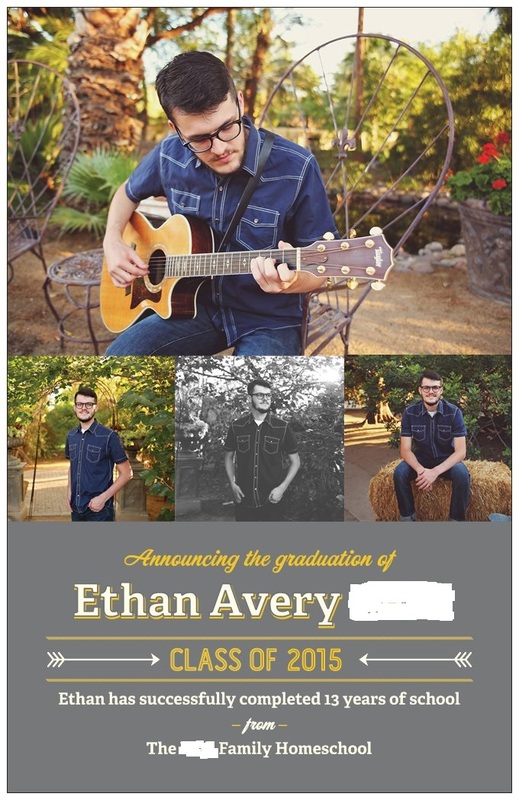 My oldest son, Ethan, did receive the scholarship he was hoping for, to attend Arizona State University. I am part of a couple different groups where homeschooling parents support each other, especially where prep-for-college is concerned. I’m struck again and again how, as a homeschooling mom of a senior, it seems like the college admissions process is WAY more about how prepared and organized **I** have been as my child’s mother/teacher, and much less about how well-educated my son is. I’m happy to report that, even though I have discovered, in retrospect, that there are a hundred things I could have done better or differently, what Ethan and I did, together, was exactly right for what he needed. I’m feeling the mercy of God on that one, because truly, I’m not kidding about those “hundred things”. Ethan turns 18 this month. He isn’t altogether eager to transition to adulthood; it’s challenging for all of us, to be frank. I have told him, “We’ve never parented an adult before, please bear with us.” We’re all learning. It’s funny, because I have often urged him to DO HIS OWN RESEARCH AND MAKE HIS OWN DECISIONS, because, even though I’m complimented by the fact that he still likes the things I choose for him — it makes me feel like I really know him — it’s healthier for him to be at least a little more independent than where he’s comfortable. So, in light of this, I turned over to him the plans for his birthday party. And, whaddya know? He has planned it for a day when I’m going to be out of town. Not purposefully; that’s just the date that works best with his friends, who are hosting. However, it’s kind of good news/bad news, “You took charge? GREAT! But you left me out of it completely?? Sad face.” LOL! Grant is the second face from the right. Grant is my son who will be 16 later this summer. I don’t think I’ve blogged about this, but what I’m going to write about here, about Grant, is kind of a big deal to me. Grant is the opposite of Ethan; he has known for YEARS where he’d like his future to be, what he’d like to do, where he’d like to go to university… He really can’t wait to get on with his adult life. A big part of that includes his plans to attend the United States Air Force Academy. To be completely honest, up until nine months ago or so, I kind of blew that off. It’s hard to get into the USAFA. Really hard. It’s even harder for homeschoolers. And, they don’t just look at academics; they look at the whole person. I had decided, in my own mind, that the chances of Grant getting into the AFA were incredibly slim. However, early last fall, I started to feel convicted. I remember having dreams while in high school, and feeling like no one wanted to help me achieve them. I remember what it felt like to be blown off. So, I started checking things out, what I could do to help Grant gain ground on his goals. I decided that I didn’t want to be an impediment to his hopes; I wanted to assist him in every way possible. So, I signed him up for the Future Falcons at the USAFA website — which is kind of a Big Deal, as it is super-official; you need the child’s Social Security number, even! I downloaded the 21-page “Instructions to Precandidates” pdf and we mapped out his sophomore to senior years of high school accordingly. And, I looked into getting Grant involved in an Air Force-related program. 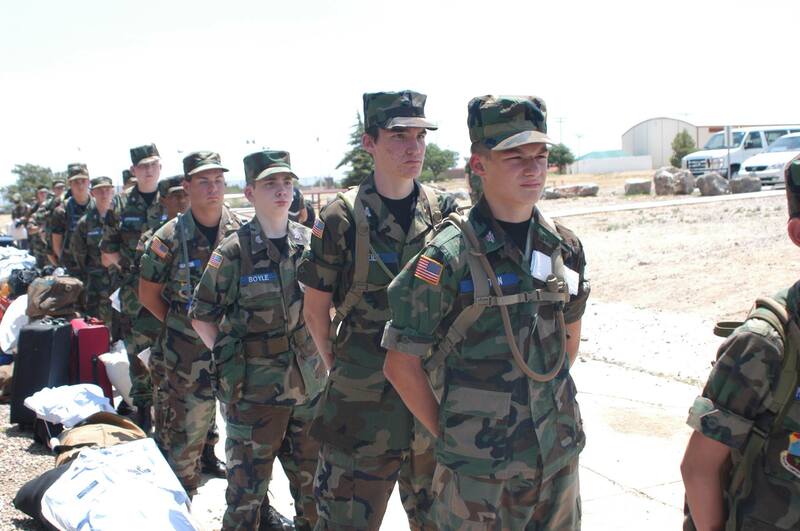 I first thought of Junior ROTC… But, then, I heard about Civil Air Patrol Cadets from some other homeschooling moms. Long story short, Grant has only been in CAP Cadets for a little over six months, but he is excelling. He’s actually at a week-long semi-boot-camp experience called “Encampment” at Fort Huachuca as I type this. Grant still has a long way to go, and many smaller goals to achieve before we can even apply to the Academy. But, all of us feel pretty good about his chances, which is 180° from where we were, about a year ago. In this coming school year, Grant’s junior year, he will be taking two classes at KEYS — a two-day homeschool co-op — and the rest at home. Grant will be taking Honors Chemistry and College Lit and Composition. Frankly, these are two teaching-intensive classes, and I was looking to outsource the most mom-dependent classes for Grant. Additionally, we’re looking at having Grant take all of his classes for his senior year at a local community college, and we wanted to ease his transition. Other than American History, Grant won’t need much from me in the coming school year; his other subjects — French, Economics, Algebra II, and a couple of others, won’t need a lot of input from me. I’m totally OK with that. My son Wesley will be in 9th grade in the fall, which hardly seems possible. He’s the youngest of our three sons, and it is a challenge for me to not think of him as “little”. He has had a massive growth spurt this past year, and his voice has dramatically deepened. Whether I’m ready or not, Wesley is no longer little. He is an excellent big brother to our toddler, Jeanie. He’s in the teen youth group at church. It just feels odd to me, still. Through much thought and research and prayer, we have decided to try Wesley at an “brick and mortar” school for this coming fall. None of our kids have ever gone to a “real” school before. But… I have long felt that I just don’t quite speak Wesley’s educational language. He hasn’t suffered under my instruction, and testing shows he is on course or ahead for his grade level. However, I don’t feel like I’m best-suited to maximize his potential, since his potential is in areas where I’m not strong. There is a charter school (publicly funded, privately run) less than a mile from us; I have checked them out before, and I like their literature-based, liberal arts approach. It’s a small school: this coming year, they’ll very likely have less than 150 students, only 9th – 11th graders. Most kids bring their own lunches (which seems trivial, but with Wesley’s celiac disease, dairy allergy, and peanut allergy, I didn’t want him to feel like he’s the odd man out, bringing his own lunch every day). And then, a good friend of ours took a job as the English teacher there. This man is everything you’d hope for in a teacher: brilliant, kind, patient, thoughtful, a good leader…. I do believe he’d be an excellent teacher for Wesley for English, which has long been Wes’ poorest subject. The daughter of that teacher, as well as another friend of Wesley’s, will also be attending the school. My husband Martin and I have discussed, toured the school together, talked on the phone with the principal, e-mailed back and forth with staff, read every click on the school’s website, and PRAYED. However, neither of us have felt any strong inclination or direction from God. We both feel like He’s saying, “All right. It’s up to you. You can give it a shot.” I’d feel a thousand times better if I had heard something more specific than that. But… It’ll do, for now. This next week, I’ll be enrolling Wes. This past year was our busiest ever, for school. With Ethan as a senior, Grant as a sophomore, and Wes in 8th grade, there were far too many days when Audrey (who just finished 3rd grade) and Fiala (who just finished 1st) would just do seat work — phonics, math, journal, and a couple of other subjects where they can work largely independently, with little help from me. In other words: the bare minimum. I have no doubt that the girls’ educational skills are up to par, or perhaps beyond their typical peers. However, I want a richer, more robust school experience for them. With Ethan at college, Grant working mostly-independently, and Wesley enrolled in a charter school, I’m VERY MUCH looking forward to a hands-on school year for the two “big” girls: art projects, science experiments, field trips, actually READING THE READ-ALOUDS in our curriculum! It should be a wonderful year. As stated in the caption of the pic at left, Audrey — who turned nine years old a couple of months ago — is artsy, funky, fun, and LOUD. All the boys did Rosetta Stone French this year, and Audrey joined in, as well. I am tickled to hear her lovely little French accent. It’s charming. 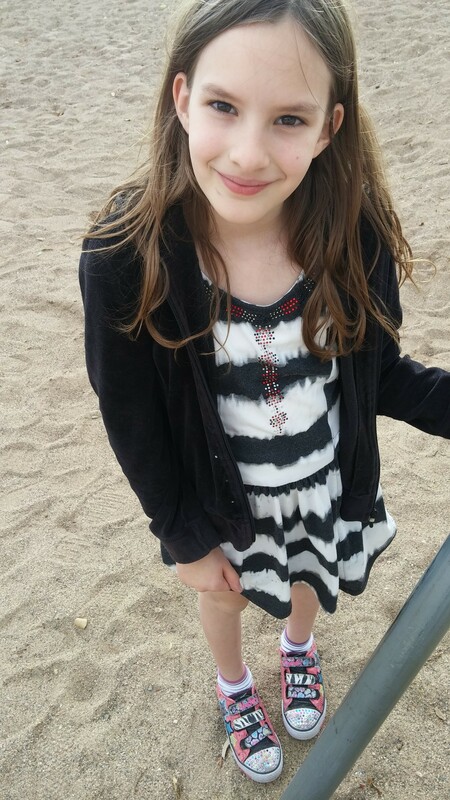 Fiala, who is six years old, is loving, thoughtful, intense, unique, and can be petulant and impulsive. 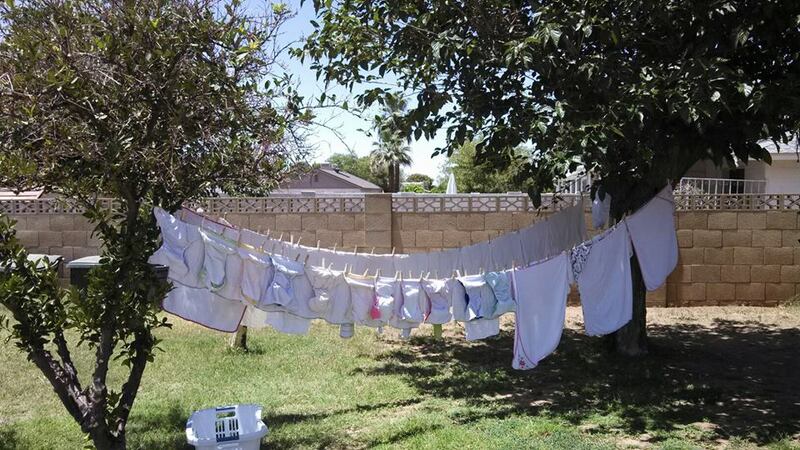 She loves swimming, loves playing dress up and changing her clothes in general — her clean, folded laundry stack is ALWAYS taller than anyone else’s. She loves waking up earlier than any of the other children and coming into my bed to “snug” with me. It doesn’t usually happen like that, but it’s a good day for Fi when it does. All in all, she is a delight of a child, my little green-eyes-freckle-nose, as I often call her. If Fiala was in a public school, she would have been in Kindergarten this last year, as she has a late-fall birthday. That seems crazy to me, as she was well-ready for first grade work. Jean will be two years old next week, which also seems crazy. I tell her that if it wasn’t for her screeching in restaurants and playing with her poop, she’d be a perfect child. Seriously: up until now, my sixth child, I have had NO children interested in their poop. Jean, on the other hand, doesn’t seem to understand what “gross” means. So, when she takes a nap, I have to put this ONE outfit on her, every time — it’s a BabyGap long-legged, button-up, one-piece, short-sleeved cotton romper. It’s the only thing that doesn’t allow access to her diaper area. Actually, “Pull-Up area”, as she is nearly completely potty-trained. We went from cloth diapers to early potty training in December, and I rejoiced, but it has taken her A Very Long Time to be serious about it. She just isn’t serious. She is a joyous little bundle of… everything. She’s still chubby and overall large for her age. She has a passion for Bubble Guppies, swimming, and dancing. She is bossy. Charmingly bossy. “Hum!” she will demand, which is Jeanie-speak for, “Come!” She will pull on your hand and do everything she can to make you comply. Or, “Hi! Hi!” she will insist, patting the seat next to her. For unknown reasons, “Hi! Hi!” means, “You sit HERE, NOW!” Or, “Tiss! !” meaing, “Kiss!” Then, “O’er side! !” Meaning, “I want a kiss on the other cheek, as well!” We all adore Jean. This past spring just about did me in. I always felt like families who couldn’t eat dinner together were doing something wrong. Well, guess what? We became that family in 2015. Sunday nights, Martin often has events at church to attend. Monday nights, I take Grant to CAP Cadets and usually sit in a nearby coffee shop, grading papers for the 2.5 hrs of CAP. Tuesday nights, Martin led worship at a weekly small group. I was leading worship just on Wednesday nights, until a group got too big and needed to multiply, but didn’t have a worship leader. I agreed — just for the spring — to lead worship in that group, as well. So, from the end of February to the beginning of June, I was gone both Wednesday and Thursday nights. 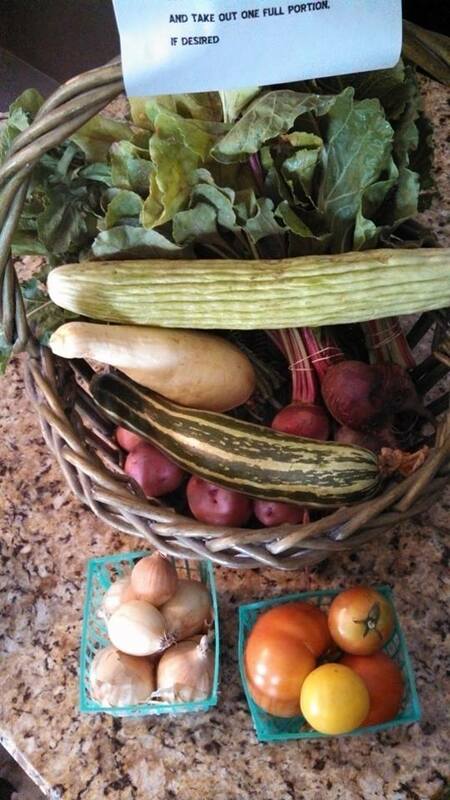 Additionally, I started hosting a CSA/farm share again for a local organic farmer, every Wednesday. I had kind of taken an six-month hiatus, but started up again in April. And, Ethan works three nights a week at Sprouts. Martin has a fairly long commute, and often isn’t home until 6:00 or so… It became like passing the baton, and the 30 minutes we’d have together before one of us needed to head back out the door was usually not at the dinner table. When you have a family of eight, dinner is loud and usually fun, but it really isn’t the place for Martin and I to connect. I’d have dinner made, but we usually didn’t sit down together. Homeschooling, church, CAP Cadets, three weekly small groups, the CSA, Martin’s commute, Ethan’s work… Lordy, I was stretched. But, small groups take a break for the summer and school is DONE, so my load is infinitely lighter. I feel much freer!! My other big things for the spring are: my garden — which is a scaled-down version of my original vision. I have one 8′ x 12′ bed in, and it’s growing wonderfully. I’m working daily (or nearly so) to put in a walk around the bed, and hope to have a second bed ready for mid-August planting. It is so hot here (yesterday hit 115°!!!!) that there is little that will grow in the heat of mid-summer. The bed that is growing, I planted in late April. I can’t really sow anything else until there is hope for cooler temperatures. I have sunflowers, two kinds of melon, Armenian cucumbers, okra, two kinds of heat-tolerant green beans, summer squash, and a winter squash growing, plus a variety of flowers. I also have way too many volunteer tomato plants, whose seed came from my compost, I suppose. I have transplanted as many as possible, replanting and giving away about 20 tomato plants. There are still far too many tomato plants growing in the garden — growing too closely with the other plants. It’s not really the right time to grow tomatoes here — ideally, I would have had them in by January or February. But, I can’t bear to yank them. We’ll see what happens. My garden gives me joy, exercise, and a sense of fulfillment. It keeps me sane. To me, gardening really is a kind of therapy. Of course, all of this is barely scratching the surface. There is much more happening in our home… An upcoming camping trip, me traveling to the Portland area for a girlfriends’ weekend, sewing projects, lots of canning, Bible studies, small and large challenges and triumphs, a continuing home remodel, birthdays — including my own, baseball, me going low-carb again to lose weight, books to read, and more. But, I will call it a day and go swimming with my kids.Blessings to you and yours. Go ahead: Bite off more than you can chew. Note the slab-slices of summer squash I’m using as bun here. 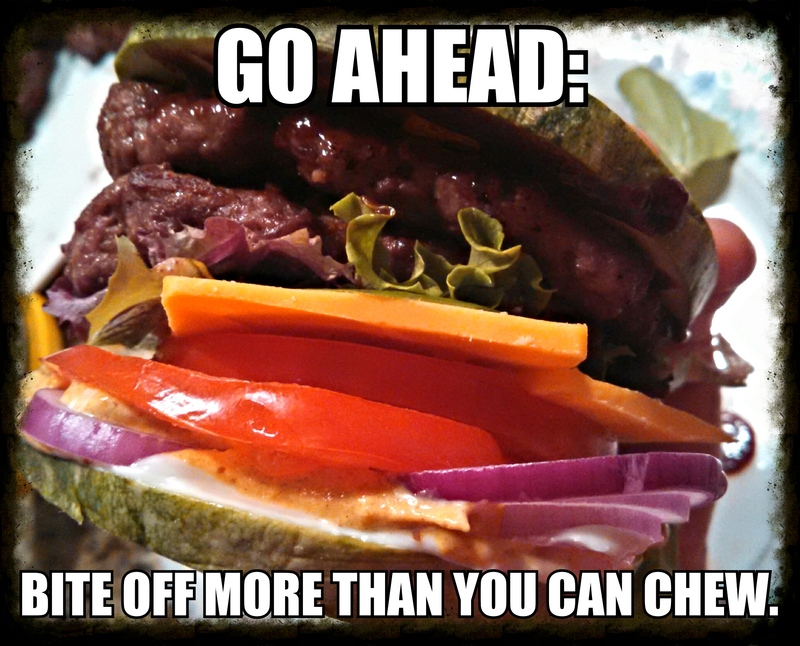 I’m enormously pleased with this burger-hack. Most people with whom I share the idea? Not so much. But, seriously, you should try it!! 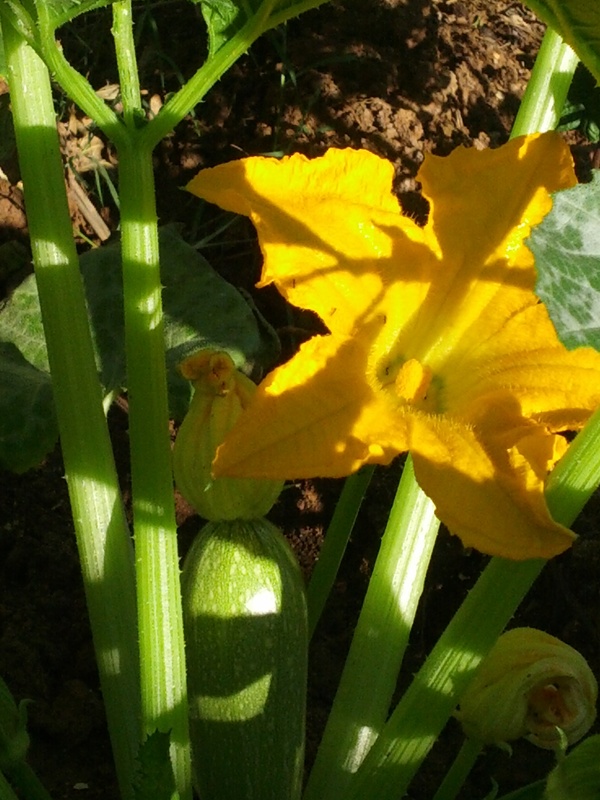 Raw summer squash is super-mild, lightly crunchy, and holds up WAY better than a lettuce wrap. I am still — STILL!! 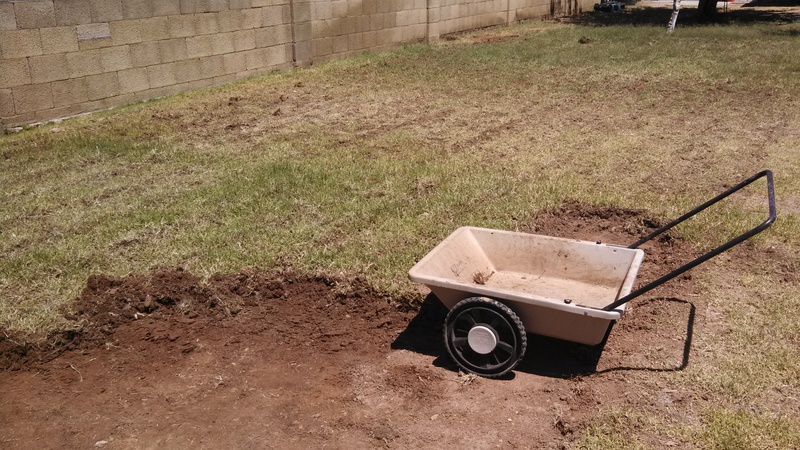 — working on converting an area approximately 21′ x 45′ from invasive, hard-to-kill Bermuda grass lawn into a vegetable garden. It has occurred to me, time and again, why raised beds are so popular. They’re a heckuva lot easier! However, I’m looking for long-term sustainability as well as decreasing water use, and to those ends, a sunken bed is the way to go in the desert. I already know that water drains off our property toward the to-be-garden corner. It takes less water to hydrate sunken beds, water doesn’t evaporate as quickly, and the soil temp stays cooler when the top of the garden bed is at or below ground-level. But, Lordy! is it ever hard work. Crap. I have just discovered that a giant section of our yard (about 15′ x 40′) is actually a stinkin’ CONCRETE SLAB, which was covered by about 4″ layer of dirt mixed with -1/4″ (“quarter minus”) granite gravel, which was topped with another 4″ or so of sod. A section of this takes up about a THIRD of my planned garden, right in the middle. This is going to take a jack hammer or a backhoe to remedy. Can you feel my disappointment? Ugh. Such a setback. I love that you say “jackhammer or backhoe” instead of “smaller garden.” That’s the Karen I know and love! This gave me much pause for thought. She is totally right: Downsizing due to difficulty was not an option. This is mostly because, if I’m going to do this, it’s probably my ONE chance! At least, it’s my one chance right now. And, I want to do it right, if I’m going to do it at all — a maxim that was repeated ad nauseum during my childhood. Secondly, if there is a giant chunk of concrete just below the surface of our yard, it probably shouldn’t just stay there; it would only cause further difficulty down the line, and eventually need to be removed, anyway. So, why not remove it now? Note: The bad news is, it’s still not removed. The good news is that it is only a footer — about 18″ wide, a good, solid two feet deep, and about eight feet long. More good news: My husband has taken on removal of the concrete footer as his own personal mission. More bad news: this mission is subject to myriad other missions, currently being tackled by my husband. It occurs to me that I typically bite off more than I can chew. As a matter of course, I take on projects that are too big for myself. I dream and plan into existence opportunities that end up being WAY more complex and time-consuming than I had envisioned. At first, I started to chastise myself for this. I get loads more accomplished by biting off more than I can chew, than I would if I took life in reasonable mouthfuls. I am compelled to study, research, and learn, to fill in the gaps of my knowledge. I am compelled to the feet of Jesus for His comfort, wisdom, and guidance. I am compelled to lean on my husband (and in increasing measure, my sons who are young men). I am compelled to ask the Body of Christ — my local church — for help. I don’t think that anyone would see a problem with the first item on my list. For items #2-4, I must note that this is a good thing for me, as I tend to too much independence. I believe that God created us to function interdependently, within our families, our communities, our churches… We need each other. I contribute my strength and abilities, you contribute yours, and we both end up further down the road, than had we been alone. Hard work is good for you — body and soul. Being productive is good for everyone around you. Being able to genuinely and completely rest after a job well-done is a glorious feeling. I’m sure there are more. Feel free to share your own ideas in the comments, if you’d like!! So, go ahead: Bite off more than you can chew. Sure, you’ll have moments of feeling overwhelmed, moments of panic. But you’ll do more, go further, and just plain ol’ bear more fruit than if you live a more reasonable life. Eurocuisine YM80 — I also purchased an expansion tray and a set of eight more glass jars, but Amazon sent TWO expansion trays and no extra glass jars. Humph. I bought a yogurt maker and I must say, the first batch?? NOT a success. There are lots of conflicting instructions out there for making yogurt. Next time, I will SCALD the raw milk (not boil it, per the instructions I followed), use already-made plain yogurt as a starter (not acidophilus caps that so many places said you could use), and keep better track of the temperature. I’ll also just make plain, rather than the honey-sweetened blueberry yogurt I attempted. 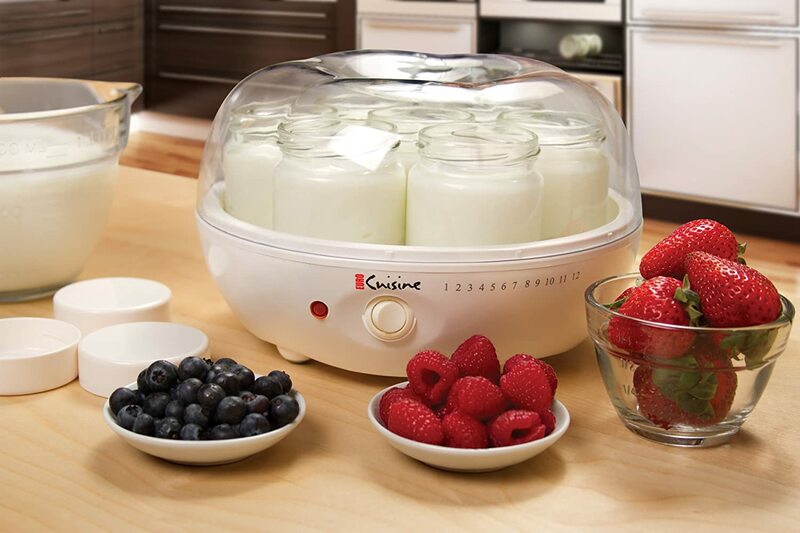 The results separated into yogurty curds and whey. The flavor was good, but the texture was horrible. We half-froze ours to make it palatable, and that worked all right. But the next go-round needs to be much more successful!! My oldest son now has a job: He’s a bagger at Sprouts, a local, natural grocer. It was really the only job he wanted, and though it took a few months of trying, he got the job! The day he was hired, he had to read 100+ pages of various employee handbooks (which he truly read, because he is thorough, like his father). I also took him to open a checking account, which had about 20 pages of various information and things to sign. As we were leaving the bank, his brow was furrowed, and I could tell he was on information overload. “So, Ethan, now that you have a job and a checking account, do you feel like an adult?” I asked. He replied, “Well, if adults regularly feel confused, then, yes, I feel like an adult.” Ha! Welcome to adulthood, my son. We are having him tithe 10%, save 50%, and the rest is his for spending and short-term savings. He looked at his first paycheck, which was for just one week, and proclaimed that the paper he was holding amounted to more than he had made doing odd jobs in the entire previous year. I had really wanted him to get a job for his own benefit — for learning how to be responsible with money; for learning how to be part of a team within a work environment; and to just take a step up in transition to adulthood… But, unexpectedly, I feel very blessed. 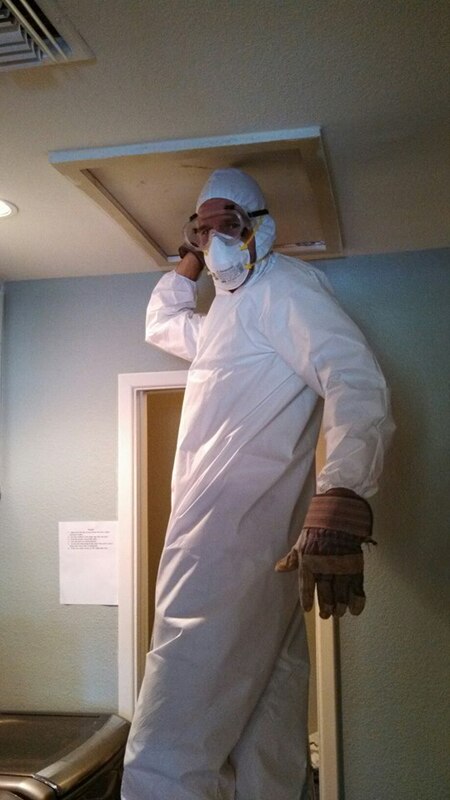 He’s not a fully grown adult, but it blesses me, knowing that my husband and I have raised a young man who is an asset to a good company, and to the workforce in general. It feels very right. I know. It doesn’t look all that exciting. And you can’t really tell the scope of the project from this pic. But I have gotten to know this little cart and a pair of shovels very well in the last week. Last Thursday, Friday, Saturday, Monday, and Tuesday, and today, I have worked HARD in my yard for 2-3+ hours daily. I am trying to transform a section about 21′ x 42′ into my real, true garden. 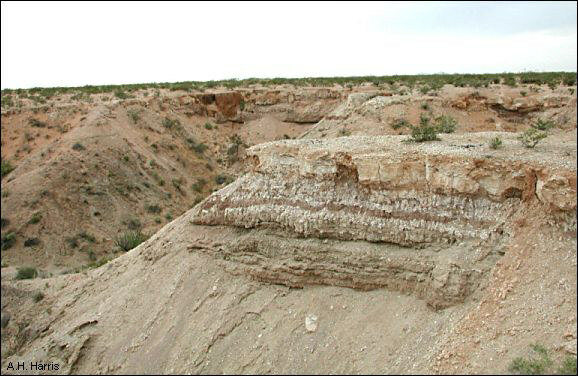 It’s difficult to explain to people unfamiliar with caliche JUST HOW ROCK-HARD our “soil” is. Technically, it’s not soil; it’s dirt. The Bermuda grass — the only kind that will grow in the desert’s heat and lack of water — needs to be removed, so I rented a sod-cutter last Thursday. Man-oh-man, that was SO punishing. So difficult. I put it at the deepest setting — 2½” — to dig up as much of the Bermuda as possible. Now, I am digging and toting the cut dirt/sod to other areas of our yard, making berms around trees. I’m only about 1/3 done with it being cleared. And here, it has mostly been in the mid-90°s. So, add “hot and sweaty” to physically challenging. I am keeping my eyes on the prize of having a productive, inviting, rewarding garden, some months from now. Once I finish clearing the area, I still need to soak the dirt, Rototill it, rake out as many Bermuda grass roots as possible, then cover the area with clear plastic to solarize — and thus kill — it. All of that is BEFORE I get to plant anything. I also need to put up a fence with a footer, not just to keep out the dogs, but to keep the Bermuda grass from creeping back in. I’m collecting interesting garden fence ideas on Pinterest. 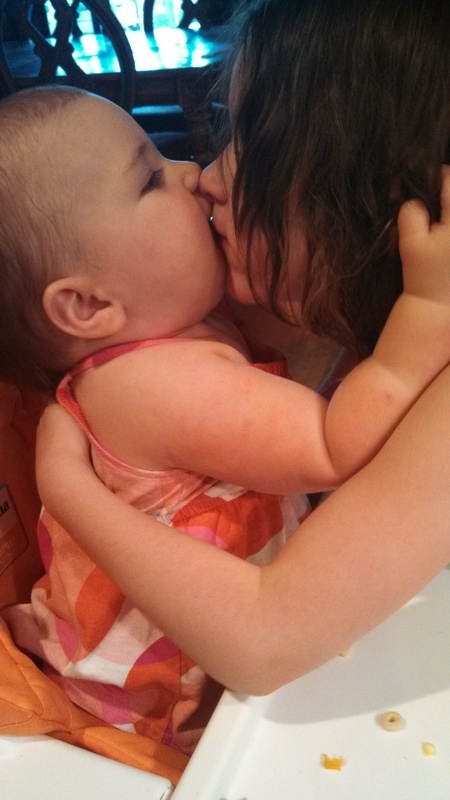 Baby Jean giving a hug and a sloppy kiss to Fiala. I absolutely love the fact that baby Jean grabs both sides of someone’s face and smashes her chubby, drooly mouth onto the kiss-recipient. This past weekend was amazing, as the last weekend in January for the last 17 years has always been for me. My church has a leadership retreat every January. That sounds run-of-the-mill, but it’s not. We attend about 48 hours of meaty, practical, inspiring teaching sessions and have powerful worship and ministry. It’s a time when the ministers are ministered to. Additionally, many leaders and pastors attend from around the world, each who have close ties to my church. This year, there were folk from Northern Ireland, Zambia, Mexico, and South Korea. Thus, we call it the Leadership Summit. I have no words to explain how powerful and amazing and NEEDED this event is. I have no great love for the desert. How I deal with this, in my heart, ebbs and flows. Sometimes, I do better than others, adjusting to the fact that my husband is a native of Phoenix, our greatly beloved church is here, and my husband’s amazing job is here, as well. This past year, I struggled a lot, though. There are a variety of reasons for that, but let’s just leave it there: I struggled. I have been sad. At the Summit, with tears, I realized that I needed to… adjust my heart. This is where I am. This is, for my husband and perhaps even for myself, the land of our anointing, in spite of the brown, the hot, the dry, the dusty, the lifeless, burnt desert. This is where our Father God has us. It just is. I don’t know why He has put a yearning in my heart for green, for rain, for humus instead of caliche, while placing me in its opposite. Yet, He has. And, I realized that I just had to accept His sovereignty and find my sufficiency in Him. On Thursday night, I prayed in my heart, “Father, You are my garden. You are my brook. You are my green, rolling hills. You are my rain.” That was hard, but it was good. The next night, I was standing there, while the worship team played and sang, just soaking it in with my palms up, receiving. A young man from Northern Ireland came over and started praying and speaking prophetically over me. “I see you in the Father’s orchard. There is fruit there. A lot of low-hanging fruit.” He proceeded to encourage me about my life being fruitful. And then he said, “And the Father is walking with you, in the cool of the evening.” !!! Those words are from the description of the time in the Garden of Eden. I laughed. I couldn’t help it. God is so good, and He is so faithful to make sure I REALLY GET IT when He speaks to me. He is my garden. Caliche, or what passes for “soil” in the Sonoran Desert. I went to the Summit in hopes of hearing from God for… distilling… sorting out… prioritizing… refocusing. Instead, I felt the Father call me to become “determined to know nothing… except Jesus Christ, and Him crucified.” I have debated whether or not to post about this on here. I want to know Jesus in… obscurity. Just know Him. Learn more about Him. Hear His heart. But, I thought it also might be an encouragement to some reading this: rather than seeking what Jesus HAS FOR ME, I’m just seeking Jesus. Everything else for which I look — direction, maturity, a “job” in the Kingdom of God, a future and a hope — is secondary, a byproduct. So, I committing a certain amount of time, really an extravagant amount of time, daily, to reading Scripture and hearing from God. I’ve started in Genesis, and am planning to read fairly quickly through the Bible, and be looking for Jesus among the pages. Yes, I know He doesn’t appear until the book of Matthew. But, really, everything in even the Old Testament points to Jesus’ appearance here on earth. I felt God tell me that, in spite of spending time that I, frankly, don’t have, He will continue to provide time. He’ll provide efficiency, focus, and clarity of thought as I go through my day. Everything that needs to get done will get done, even as I attempt to delve into the Word of God for several hours daily. SEED GIVEAWAY NOW CLOSED TO ENTRIES!!!! I have deleted all the non-entry comments so as to get a more accurate count of the entries… Just a note: I tried to contact most folks who put all their entries in one comment to ask them to return and create multiple comments — one comment for each entry, as per the rules. If I wasn’t able to contact you, I’m sorry!! All winners chosen through a random number generator (from http://www.random.org). Oldest entry is #1, newest is #323. First selected gets first choice. I will post both on my Facebook page and on here as I select winners. The second winner is comment #173, Vickie! She said that she would like the Can You Dig It? kit as well, which was the choice of the first winner… So I have sent an e-mail out to Vickie asking her what her second choice would be. The third winner is comment #165, Cindy in GA. She also wanted the children’s kit. After Vickie (winner #2) chooses, Cindy will get her choice of the remaining prizes. The fourth winner is comment #303, Alex. Alex will get whichever prize remains after Vickie and Cindy have chosen! I WANT YOU TO GROW THINGS. I want you to try your hand at gardening, even if gardening means putting a few seeds into a windowsill pot and hoping they sprout. Intimidated by lack of experience. Not enough money to invest into a garden. Honestly, I’ve had to battle my own gardening challenges and disappointments. The home into which we moved, July 2012, has ample space for a really big garden, but we decided to prioritize remodeling the indoors before we tackle the yard. 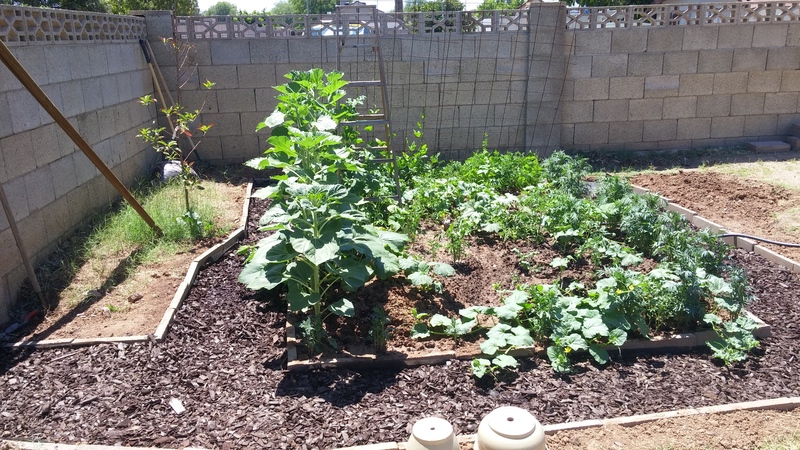 We live on nearly half an acre, but as I recently blogged, it takes a LOT of work to prepare the soil to grow things, here in the Phoenix area. You can’t just scatter seed and expect it to do something. But… I am often encouraging friends to just grow SOMETHING. Just try. I want to equip you to try your hand at growing something. I was recently thinking about how much I love Botanical Interests. They’re a seed company whose home is just outside of Denver, Colorado. All of their seeds are non-GMO. Many of their seeds are organic. I love that I can find Botanical Interests’ seeds locally. They have fabulous customer service. The art on their seed packets is gorgeous. The information on their seed packets is second-to-none: It is detailed, helpful, and educational. I love that their seeds are reasonably priced, even the organic ones. Having a wee bit of a brainstorm after not winning this giveaway, I thought that perhaps Botanical Interests would sponsor a seed giveaway on MY blog. Happily, they quickly agreed! In fact, they agreed to a BIG seed giveaway!! There are FOUR separate prizes which will go to four winners and TEN ways you can enter. Yes, you can enter ten separate times. But, you can only win one prize. Can You Dig It? Children’s Gardening Kit. 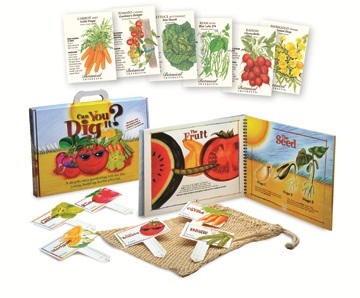 This retails for $29.99 and is a package that includes a colorfully illustrated instruction book, garden supply list, planting map, horticultural glossary, a reusable harvesting bag and garden markers. 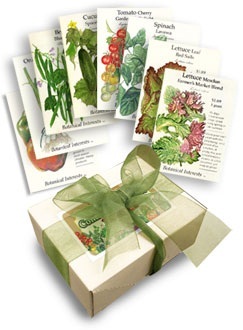 The seed packets included in this collection are: Carrot Baby Little Finger, Tomato Cherry Gardener’s Delight, Lettuce Butterhead Tom Thumb, Bean Bush Blue Lake 274, Radish Cherry Belle, and Marigold Dwarf Lemon Drop. This would be perfect for a homeschooling project, a weekend family project, or as a project to do with your preschoolers! You and your children can learn together!! Water-Wise Flower Mix. Two large packets of seeds, enough to cover a total of about 500 square feet with water-wise color, both annuals and perennials. It contains a mix of 20 different flowers like Arroyo Lupine, Sulphur Cosmos, Orange California Poppy, Moss Verbena, and Pink Evening Primrose. Retail value: $9.98. Container Vegetable Seed Collection This collection retails for $15.00 and contains eight packets of seed, all selected to grow well in containers or other small spaces. Included are: Carrot Tonda di Parigi, Cucumber Spacemaster, Kale Dwarf Blue Curled, Lettuce Mesclun Farmer’s Market Blend, Onion Bunching/Scallion Tokyo Long White, Pepper Sweet Cherry Blend, Spinach Lavewa, and Tomato Bush Better Bush. 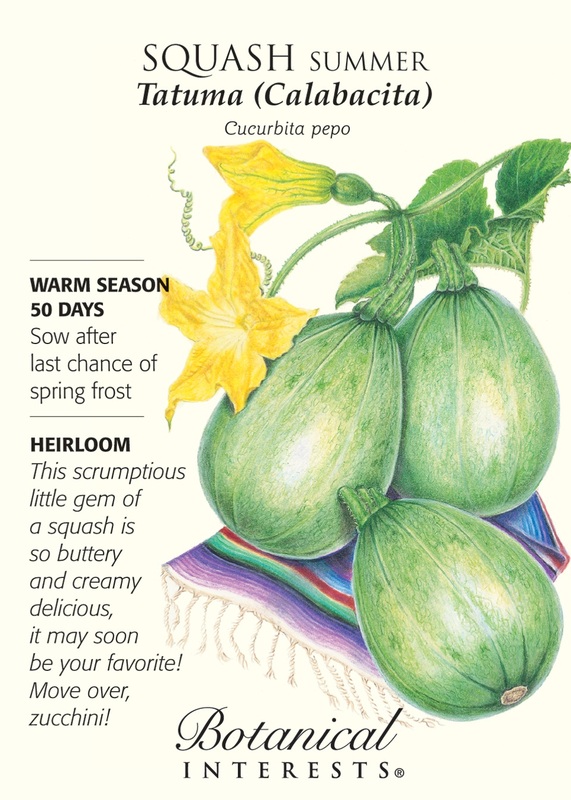 Tatuma Calabacita — this WILL become your new favorite summer squash. Now… here are the TEN DIFFERENT WAYS YOU CAN ENTER! Please leave ONE comment for each entry. Yes, that means you may end up leaving a whole bunch of comments. That’s OK. There is no maximum number of times to enter; I would be tickled if you did every single thing on the list. Also, if the entry requires you to take some action, do it BEFORE you comment. In each comment, tell me what you did. Post a comment below telling me which prize you’d most like to win, and why. Like Only Sometimes Clever on Facebook. Like Botanical Interests on Facebook. Post a link to this contest on your Facebook page — other than your personal profile (for instance, if you own a company, or have a blog, or moderate a group that has its own Facebook page). Post a link to this contest on Pinterest. Write a little blurb and include a link on your personal blog. Send out a Tweet promoting this contest with a link. 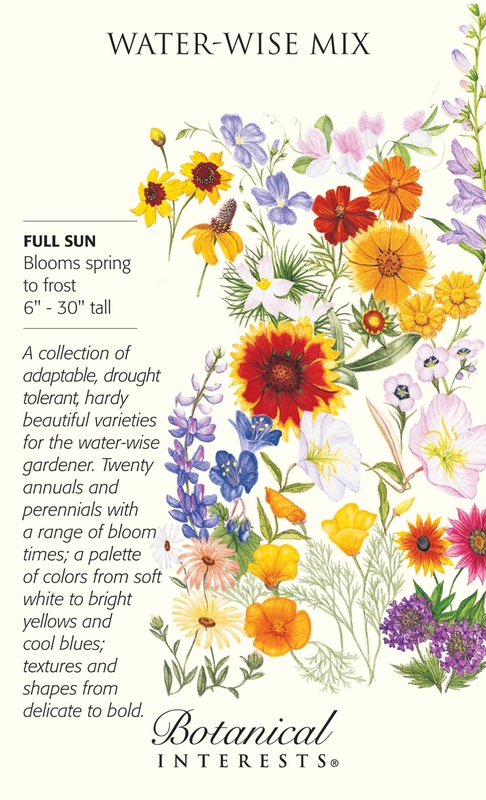 Download a PDF catalog or request a print catalog from Botanical Interests. Contest ends at midnight, Mountain Standard Time, on Wednesday, February 13, 2013. Four winners will be selected at random on Thursday, February 14. I will contact the winners by e-mail, so make sure you include a valid e-mail in your comment registration. First selected will have first choice, second will have second, and so on. If winners do not respond within three days, I will select a new winner (or winners) at my discretion. All prizes will be awarded. Giveaway open to legal United States residents aged 18 and over. Odds of winning depend on how many entries are received. Winners agree to have their first names and locations published here on Only Sometimes Clever. This contest is being sponsored by Botanical Interests, and the prizes provided by their generosity. However, I am not being compensated for this in any way!! It really is because I want you to GROW SOMETHING!!! CSAs, city ordinances, and scary neighbors, oh my! Looks pretty good from the air, doesn’t it? Though this is Phoenix, it isn’t actually my neighborhood…. Not even close. I tend to shy from endeavors that require me to be consistently organized. It’s not in my nature. It stresses me out. I’m MUCH better-organized that I used to be; it’s a necessity if you have five children and homeschool; homeschooling requires at least a modicum of organization. But, in general, I know my limits, and I don’t willingly volunteer for something that taxes my shaky organizational skills. However, if you follow OSC on Facebook, you’ve probably seen my offer for you to join a Community Supported Agriculture — CSA — pickup that I’m hosting at my house. This is something new for me; I’ve never done anything like that before, where I am the point man. Point woman. Whatever. The CSA with which I have been a member for two years is now defunct, because the farmer needs back surgery. That’s one of the dangers of buying your produce from one farmer! If she’s down for the count, the food supply ends. Not to sound callous about it; I’m very sad for her. We’ve developed a nice relationship and it hits me in the heart that she is in pain, and that her dream of being a direct-to-consumer farmer has gone up in smoke. But in my everyday reality, her ceasing to function as a farmer means that I need a different source for my veggies. If I want know who is growing my produce — which I do — I needed to find a different farmer. 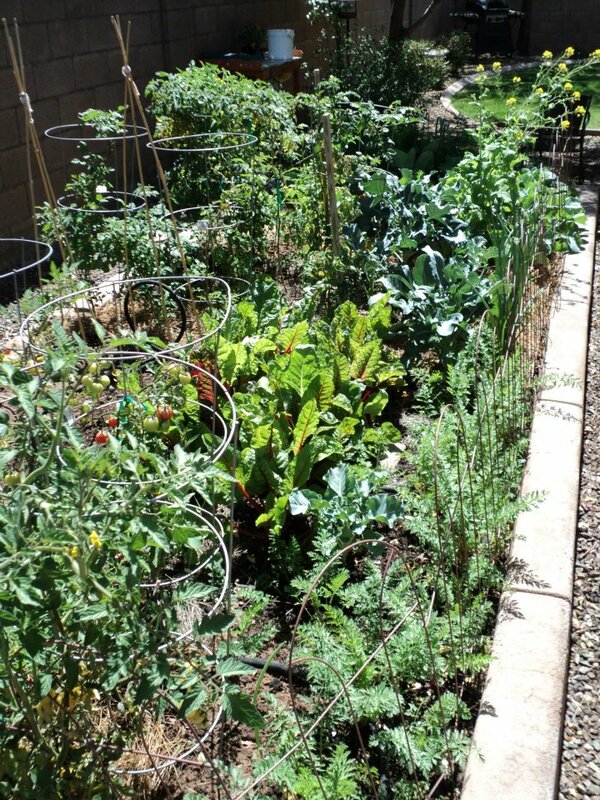 There are a number of CSAs and similar opportunities around Phoenix. However, I wanted one whose cost was reasonable, and whose pickup location was near to me. There weren’t any who met that criteria. However, one farm — Crooked Sky Farms — had a number of people interested in joining a farm share in my area — many of whom had participated in times past — but no one currently acting as a coordinator. If I agreed to be a coordinator, I would get lots of veggies for myself. AAALLLLLLLLLL for myself. About $40 worth of organic vegetables for “free” every week, to use to my heart’s content — with which to cook, to experiment, to preserve…. As someone who is constantly trying to trim the grocery budget, yet eat in an ever-increasingly healthy manner, this was VERY appealing to me. I really do want to equip others to eat better. Food matters. 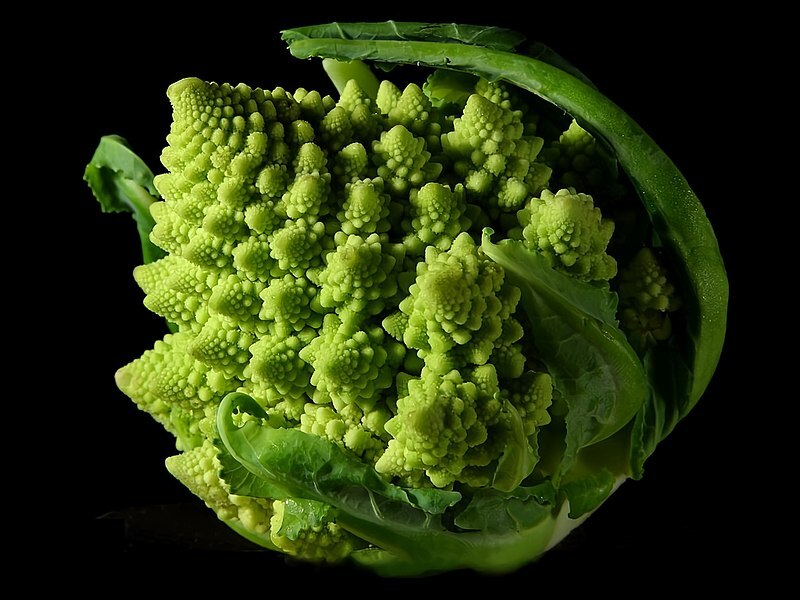 Food is intricately connected to our health. If we eat better, our health will be better; it’s that simple. Healthier individuals make for a healthier society. I’m interested in having a healthier society than we currently do, here in the United States. We can’t get there without baby steps. Eating organic is both an individual baby step and a societal baby step. Farmers matter. Crooked Sky is single-farmer run, and employs 15 people or so. Small business matters. Small business DONE WELL is important to the economic strength of a community. How we treat the earth matters. How food is produced matters. Farming in particular, when done badly, is a tremendous source of soil depletion and pollution. When done right, it is a tremendous source of soil enhancement. Done right, farming IMPROVES the land. Crooked Sky Farms won a local award for the best organic farm of 2012. With my two years’ experience of CSA participation, I had already decided that if I switched CSAs, I would prefer to join one that was just a little larger, still owned and run by one farmer, but with a little more diversity… I mean… if there’s a drought (which is likely!) or one planting utterly fails due to soil organisms (which is likely!) if the farmer has only 3-4 other veggies going at the same time, my share is likely to be sparse. But, if the farmer has 30-40 things growing simultaneously, if one crop fails, I probably wouldn’t even know about it! Farmer Frank Martin with Crooked Sky runs about six fields in the Phoenix area — mostly urban infill projects (which also delights me) — and has a few more further south in Arizona. A diversity of locations means that all of his eggs aren’t in one basket, so to speak. If I hosted the pick-up at my own home, that would mean I could — duh! — stay at home, which is easier for me. I really try to minimize the number of times, weekly, that I have to leave. Going places simply takes a lot of time. I figure that even if there are people filtering through my home for 2-3 hours on a weekly afternoon, I can still prep dinner, answer kids’ questions, and otherwise attend to my home and family, which would not be possible if I was camped in a parking lot somewhere, waiting for folks to come pick up their produce. Given that preponderance of good reasons to join the Crooked Sky CSA, I was willing to immediately jump in with both feet as a coordinator. My husband, though, cautioned me with a, “Whoa, girl!” and suggested that I contact our city to ensure that hosting an in-home pickup wouldn’t be violating any city ordinances. The reason behind his suggestion is that, well, my hubby is a by-the-book kind of guy. Additionally, we knew that one of our neighbors had already brought a lawsuit against another neighbor for an illegal in-home business. Even though I could see the wisdom in making sure I was covered by the City of Glendale, I wasn’t thrilled about doing so; bureaucratic hoops through which I need to jump annoy the snot out of me. They’re difficult to unravel and time-consuming. Half the time, they don’t even make sense! All of this proved to be true. It was difficult to even FIND the right person to whom I should talk. Then, the initial response from that city employee was that I would have to obtain a Conditional Use Permit to allow a business to function out of my home. To do this, a city employee would be assigned to me to help me walk through the process, then I would have to attend an evening hearing during a city zoning meeting. Well, all right…. I would do it. THEN, the employee told me that the fee for this process is $1,086. WHAT????? Clearly, it made no sense for me to have to fork over that kind of dough for an enterprise for which I would be making basically no money. I see it more as a community service, rather than a home business. I do benefit from hosting the pick-up at my home, but it’s not really a money-making enterprise. I appealed to my contact person at the City. She said she would “go to bat” for me at a weekly meeting where these matters were discussed. When she called me back about a week later, the news was GOOD!! I did not have to obtain a permit!! However, she did tell me that though the City decided that what I was doing did NOT constitute an in-home business, that “there’s no problem until there is a problem.” In other words, if a neighbor decided that they were tired of the extra traffic, they could call and report me to the City and then I probably would have to obtain a permit to continue. She advised me to contact all my neighbors and tell them in advance what I’m planning to do. I had already thought about that, but had sort of been dragging my feet, especially as I knew at least one neighbor was quite litigious, and we only really know two other neighbors on our street. But, what had to be done had to be done. So, I printed up my CSA FAQ sheet, the CSA contract (in case anyone wanted to join), and a cover letter to give, in an envelope, to each neighbor. And, on Saturday, I went a-knockin’. I planned to visit 13 houses: the house directly across the street from us, plus the three houses to the east, the three to the west, on both the north and south sides of the street. Fiala and Wesley went with me for about half of the visits. I had to do it in sections, as talking to neighbors is pretty time-consuming! I did get it all done in one day, though. Of the 13 neighbors, I talked with nine of them in person; for only four did I have to simply leave the envelope half-tucked under the front door mat. I thought that was pretty good results. Most of the people with whom I spoke I’d never met before! I have some really great neighbors. 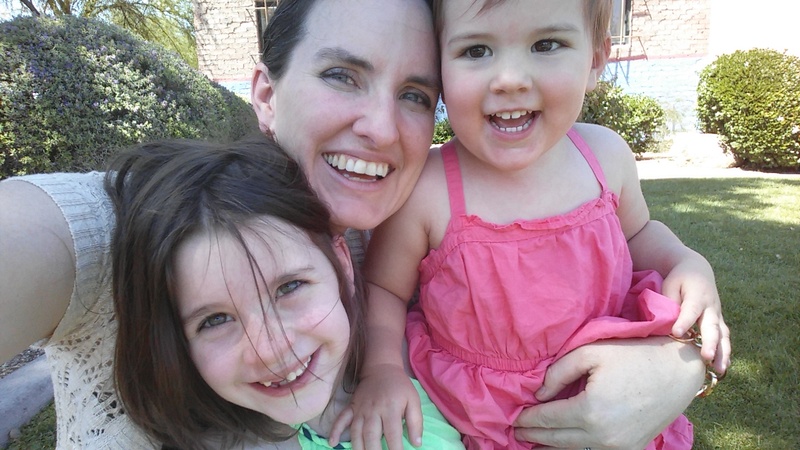 My kids were hoping I’d discover some children… Only one: a ten-year-old girl, previously unknown to us. The litigious neighbor of whom I was a little afraid… well, he wasn’t home. I met his wife for the first time, and she was LOVELY. She was also from a family of six children, and thought it was wonderful that I was expecting my sixth. She invited me into her home, which smelled amazing — chili simmering on the stove! — and we had a wonderful chat. Another neighbor, whose grapefruit tree’s branches are dripping with uneaten, ripe grapefruit said we could come pick them at any time! One family on our street is from Bosnia. It’s a four-generation household. I think that’s wonderful. I learned some things about our next-door neighbor, the neighbors whom we know best… that they eat almost-all organic, that they use herbs as medicine as much as possible, and that they have a fledgling garden (the garden part, I did know already), and that they compost… Hmmm…. sounds familiar!!! I do still worry a bit about the folks with whom I was unable to speak directly. But, over all, I would say that the endeavor was much more successful than I anticipated. And I feel wonderfully having met new-to-me neighbors. But I think that would completely tax my organizational skills! !